They're absolutely obsessed with hydration and moisture retention, all with the aim of helping skin feel fresh from within. Rather than creating products chock full of oils that might sit heavily on your skin, they've endeavoured to produce skincare that you'd feel comfortable layering on. Easily absorbed and alcohol free, their Skin Conditioning Gel is a whopping 81% water, the same level as cherries and grapes. 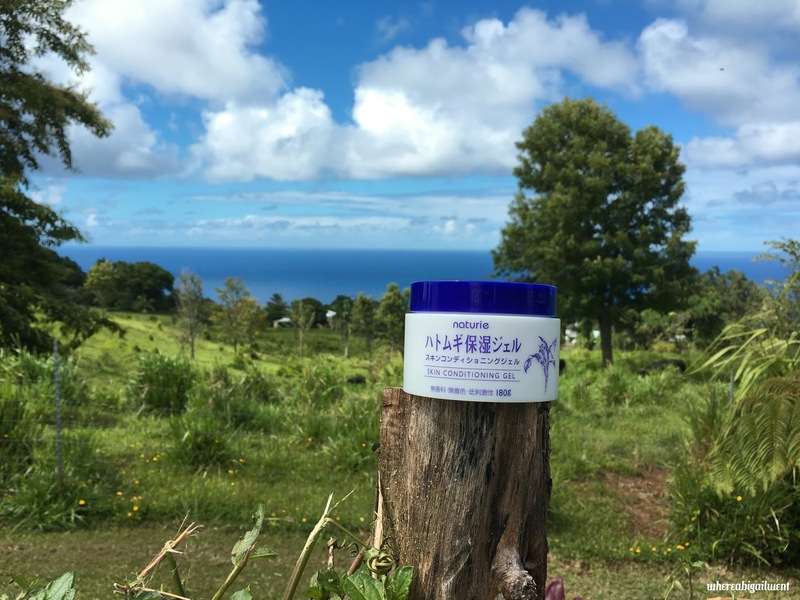 The star ingredient of their products is a natural plant extract: hatomugi, to be precise. Known also as Adlay, Coix Seed or Job's Tears, it's actually a very commonly used ingredient in Singapore. We call it pearl barley, and old wives tales say that drinking lots of barley water helps keep your skin clear. Given Naturie's research into the moisturizing properties of hatomugi, there might be something to this folk remedy after all. 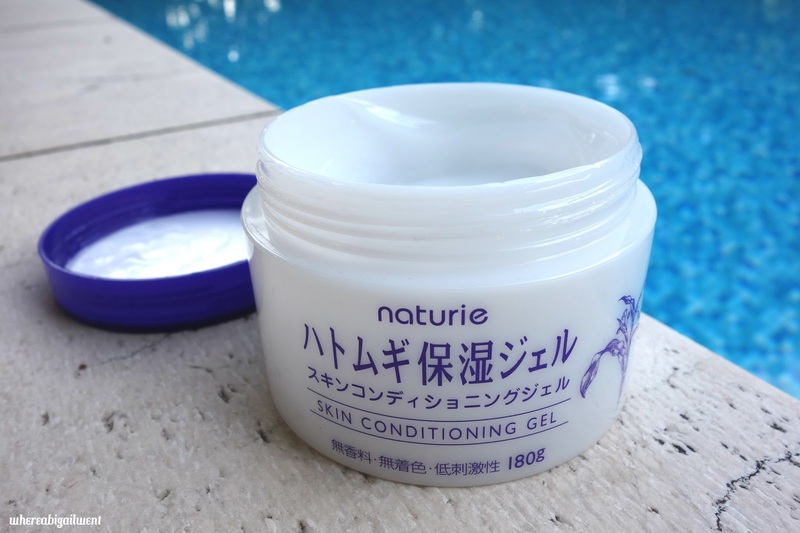 I get a feeling that the Job's Tears/Croix Seed/Pearl Barley/Hatomugi Skin Conditioning Gel is enjoyed by so many users in spite of its packaging, which isn't the prettiest. In a market chock full of sleek bottles or bijoux packaging in ultra on-trend dusky rose gold, it almost seems unlikely that this rather unwieldy tub should take pride of place on so many vanities. Alright, I admit, I'm not a big fan of the packaging. Questions of style aside, every time I dig in, I get a faint frisson of panic - Have I washed my hands sufficiently thoroughly? Am I about to contaminate the whole tub? It doesn't help that the product contains no colouring or fragrance additives, so the gel itself is a scent-free and colourless gloop. It makes me think of agar and petri dishes. In a roundabout way, I guess it helps inculcate good habits, like making sure your hands are totally clean before applying anything to your face. But either way, get a dedicated spatula, like I did. Unfortunate looks aside, I have to say that I've grown very fond of using this skin conditioning gel, because it works. Given that it's #1 in the Body Lotion/Body Milk category on Cosme, and also received a spot in the coveted Best Cosmetics Awards 2016 for Mid-Year New Products, it's probably going to work well for you too. 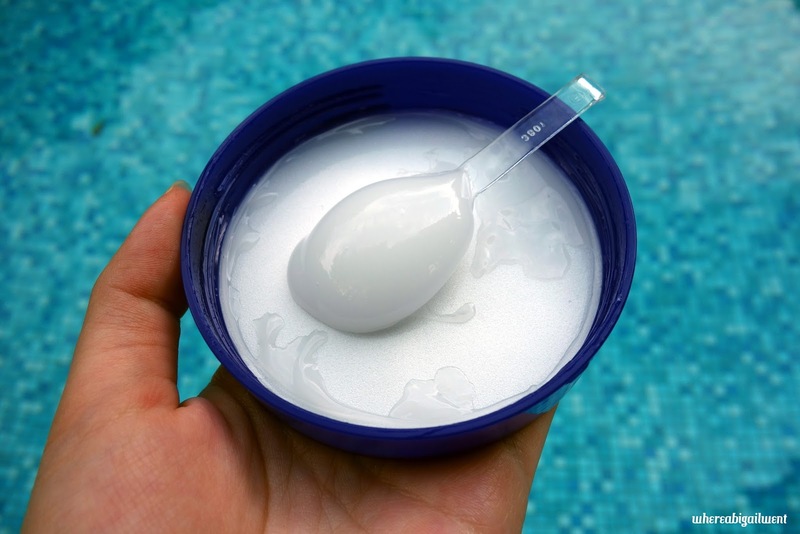 The gel spreads so well thanks to its high water content, which also gives it a really cool and soothing feel. Plus, it's got so many uses. 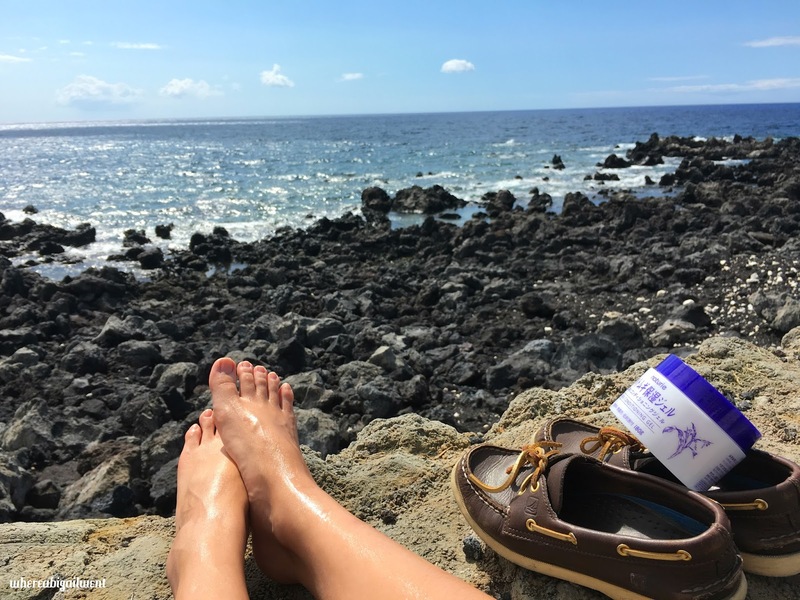 In Hawaii, I used it as an all-over body lotion after hot showers to keep moisture locked in, as an after-sun cream, and as a day and night face cream. The result: No more scaly legs or patchy elbows, a really nice and even tan, and it also managed to quell my breakouts. I'm not the only one who found it really useful: J's nose began peeling after a day in the sun, but after dabbing a little of the gel on the offending area a couple time, a day later it was back to normal again. There's something in it for the whole family. 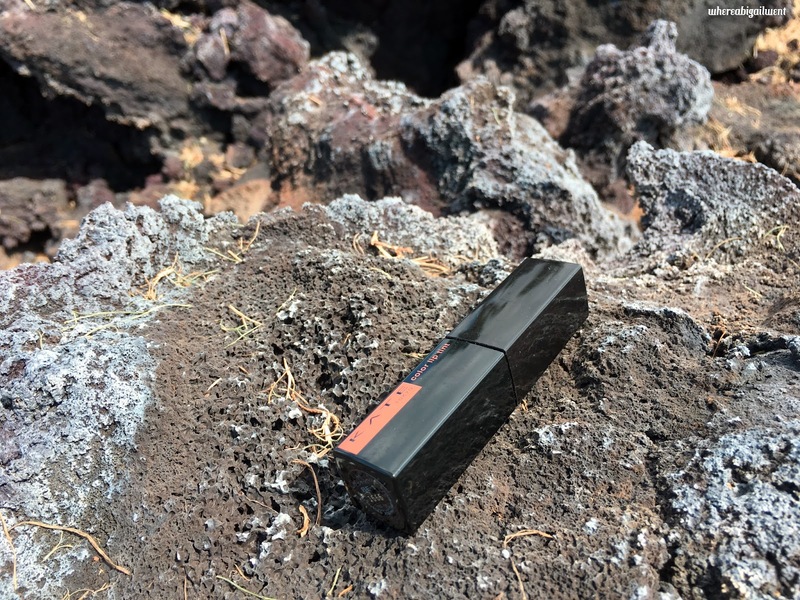 If you're looking for the one skincare product to bring with you when you travel, you're looking at it. Hell, if someone asks me what I would like to bring with me onto a desert island, drinking water and getaway chopper aside it would be nice to have this skin conditioning gel on hand. At 180 ml, the original tub is too big to bring on the plane with you, but I'm planning on decanting some into a TSA-approved container so I don't become a dried out husk the next time I fly. Back home, I've continued my way through the tub at a steady rate. Naturie recommends that you spread two 500 yen coin-sized dollops worth of product across your face, which makes for a really lavish yet inexpensive hydrating face mask. Leave it on for five minutes, then gently but firmly press the excess in. This might be a little excessive for day use, but it's become my go-to nightly routine. My skin still looks as plump and radiant as it did when I was on holiday, which is no mean feat. Get this and other great Japanese products right here at Wonect!